Most people are looking for ways to lose weight while there are others who want to gain some weight in a healthy manner. Unfortunately some people end up eating junk food and unwanted health supplements, instead of looking for healthier alternatives to gain weight. If you want to gain weight, don’t choose non-nutritious and high-calorie junk foods. Opt for the foods which are loaded with nutrients and supply you with energy. Indian foods can be selected and modified for high calories to gain weight. Foods must be categorized against five-point criteria i.e. high calorie, moderate fats, high protein, high fiber and high nutrition. Pulses, cereals, meat, bread, rice, carrot, spinach, pumpkin, eggplant, dry fruits, and nuts are the calorie rich food. Fish, eggs, skinless chicken, lean meat, pulses, sprouts, and dairy products are the rich sources of proteins. Healthy fats can be obtained from nuts, leafy veggies, salmon, flaxseed oil, and mustard oil. Healthy fats are also a rich source of omega-3 and omega-6 fatty acids. Green and leafy vegetables are loaded with lots of fibers and fruits have high nutritional value. Listed below are some Indian foods which are an essential part of Best Indian diet for weight gain. Dried Beans (Dal), Rice (Chawal), Roti, vegetable curries (Subzi), and dairy products are considered as traditional Indian food. Milk and dairy products are loaded with protein, carbohydrates, and many nutrients which help healthy weight gain. A 100 ml serving of full-fat milk contains around 3.4g of protein, 4.6g carbohydrate, and 3.3g fats. Opt for whole milk which has more fat content than skimmed milk. Potatoes are rich sources of carbohydrates and complex sugars. Consuming grilled or baked potatoes help in quick weight gain. When it comes to weight gain, about 40% of your diet should consist of carbohydrates. Potatoes are rich in carbohydrates and amino acids (glutamine – arginine). Hence, it is a good food option to gain weight. Starchy vegetables are high in Calories. Include Sweet Potatoes, Beets, Indian Pumpkin, Carrots, Corn, and Green Peas and other starchy vegetables in your diet. These foods are high in calories and high in nutrition. Green, leafy vegetables such as Spinach, Fenugreek, Cabbage, Coriander, and Cauliflower are high in fiber. Fruits such as Mango, Coconut, and Banana play a keen role in weight gain. Eating approximately 80 to 100 gm coconut or drinking Coconut milk may increase the body weight. Bananas are rich in carbohydrates. A single banana contains 105 calories. A medium sized Mango has 150 calories. It is a rich source of carbohydrates. Clarified Butter, also known as ghee helps to gain weight very quickly as it contents saturated fats. It also enhances absorption of minerals and vitamins in the body. To gain some weight in a healthy way, follow the Indian diet plan which will provide you the right calories and proteins. The Indian diet plan has an enough of options for vegetarians as well as non-vegetarian. Start your day with a cup of coffee/ tea with sugar and full-fat milk, Egg white/Banana and Soaked Almonds. In breakfast, consume a full bowl of cereal, toasted bread with butter, and fruit. Instead of butter, you can always pick cheese or clarified butter or peanut butter. 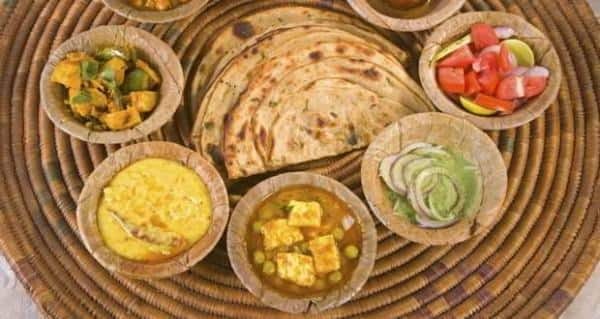 Two pieces of multigrain bread with low-fat butter and egg omelet or a bowl of corn flakes, oats, or porridge or Daliya khichdi with lots of vegetables or two chapatis with a medium bowl of veggies or two stuffed Parathas. Eat Fruits or drink a glass of fresh fruit juice. Two small pieces of chicken, a piece of fish, eggs or paneer. Green salad comprising cucumber, cabbage, radish, carrot and tomatoes. A small bowl of yogurt/ curd/ buttermilk. Dry fruits or nuts can be something that does not add much calories and can yet be nutritious and filling. Boiled vegetables or cheese sandwiches can also be a great addition to your diet. A small bowl of khichdi or three chapatis. Two pieces of chicken or fish or couple eggs or paneer. Drink a glass of milk with a pinch of Turmeric added to it, before going to bed. Things to remember: Weight gain is a time-consuming process. But one has to be patient and follow it correctly. Aim to put on weight in a healthy way because that is something that will stay for a longer period of time than eating something unhealthy and gaining weight!